Please seriously consider sponsoring a child–or two–or more–to help give him, her, or them a brighter future and the desire to help change their own communities for the better. 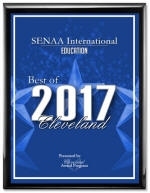 This is not a paid advertisement, but an appeal to you from SENAA International and its members, in collaboration with Children International, to make a difference in the life of a child. It doesn't cost much money, and the rewards—in your life and in the child's—far outweigh your small sacrifice. You literally have the power to change the world for a child. 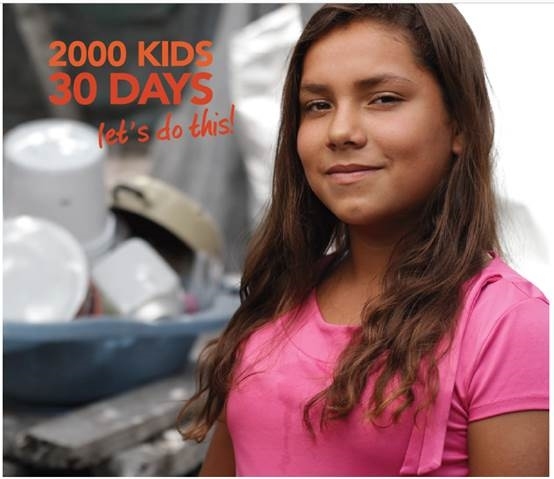 Whose world will you change in the next 30 days? 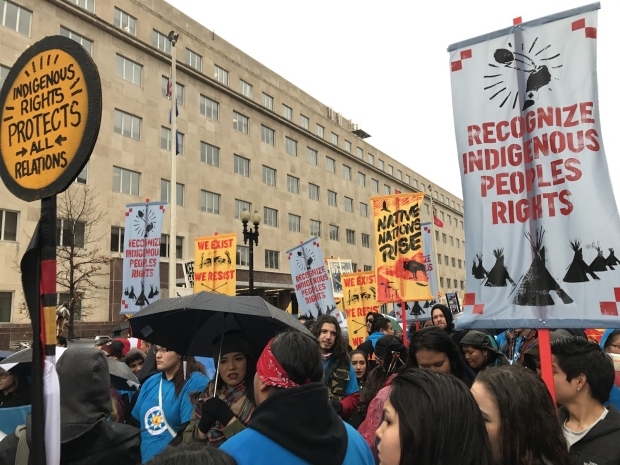 The Trump administration has yet to release its revised Dakota Access Pipeline decision, more than two weeks after it was announced in federal court. 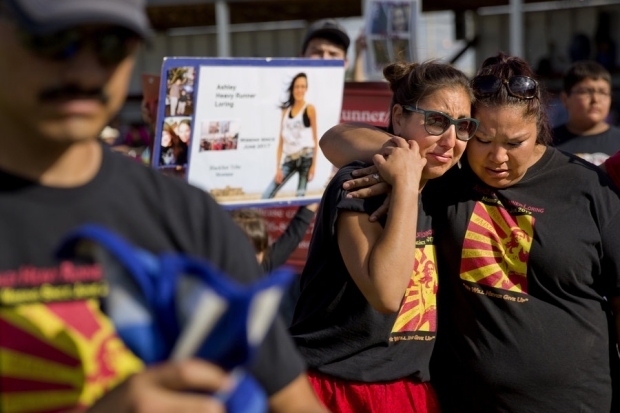 For decades, Native American women have been disappearing across both the US and Canada with little law enforcement recognition or media coverage. The US Justice Department plans to do more. 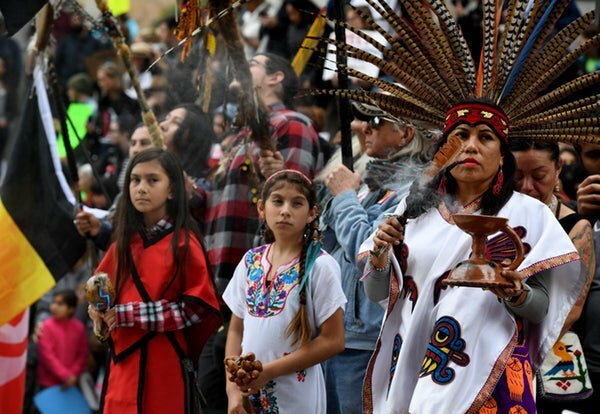 Albuquerque, N.M. -- The US Justice Department will double the funding it grants tribes for public safety programs and crime victims as it seeks to tackle the high-rates of violence against Native American women, a top official said. 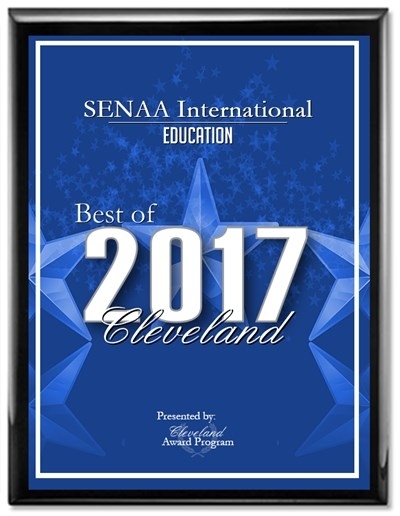 Oct. 2, from 5 to 8 p.m., San Juan High School, 311 N. 100 E, Blanding. Oct. 3, from 5 to 8 p.m., Bluff Community Center, 190 N. Third St. E, Bluff. 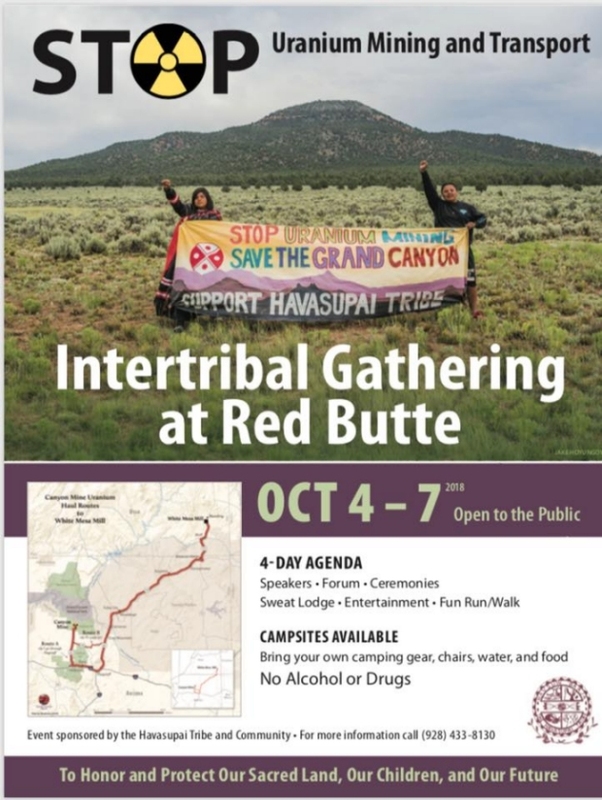 Oct. 4, from 5 to 8 p.m., White Horse High School, Utah Highway 262, Montezuma Creek. Residents may speak with resource specialists, ask questions and submit written comments. 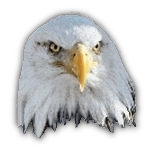 Written comments also may be submitted through Nov. 15 via mail or email. 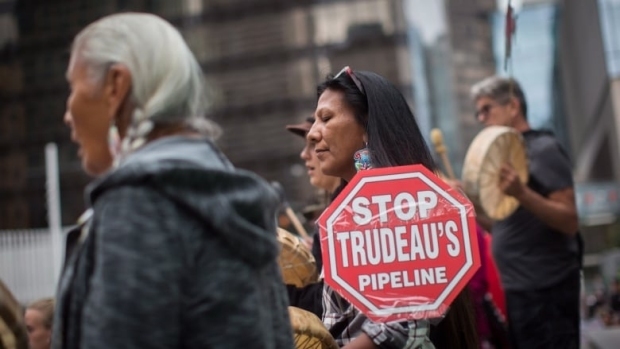 The Federal Court of Appeal last month quashed the approval given to the project, saying the consultation with Indigenous communities wasn't good enough and criticizing the lack of attention paid to the environmental impact of increased tanker traffic off the coast of British Columbia. An official close to the plan told the Canadian Press one option being closely considered is hiring of a former senior judge, possibly a retired Supreme Court of Canada justice, to advise the government on what would constitute meaningful consultation with Indigenous communities to satisfy the conditions of the court. 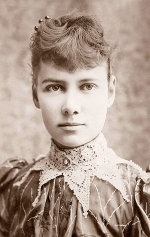 SANTEE, Neb. — The important looking man walks to the front of the room. In the crowd, the important woman and the 50 others fall silent. The Important Man is wearing pressed slacks and an ironed dress shirt. He glances at his notes and clears his throat. “It’s a tremendous honor to be here with you today,” he says. The Important Man’s name is Jeffrey Bolton. He’s a bigwig at the most famous hospital in the United States. He flew on an airplane from Rochester, Minnesota, to this Santee Sioux Reservation in rural northeast Nebraska to say what has gone unsaid for the past 156 years. The Important Woman sitting in the crowd is named LeAnn Red Owl. She and many Red Owls in the audience today are the descendants of the great warrior Marpiya Okinajin, commonly known as Cut Nose. These Santee Dakota people hitched rides and drove in used cars from as far away as Omaha to be inside this casino conference room. 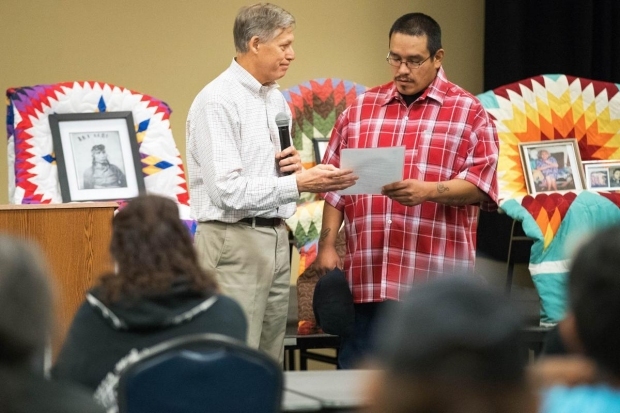 They are here to hear what they have needed to hear for the last seven generations since the Mayo Clinic treated their ancestor’s body like a hunter might treat a deer head he mounts on his wall. This story was originally published by High Country News, and is reproduced here as part of the Climate Desk collaboration. 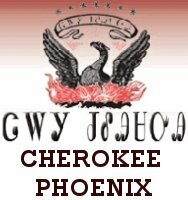 Uranium, it’s now part of Navajo DNA. With over 500 abandoned uranium mines on the Navajo Nation, people living near these mines are exposed daily to radiation exposure at a rate several times higher than normal background radiation. 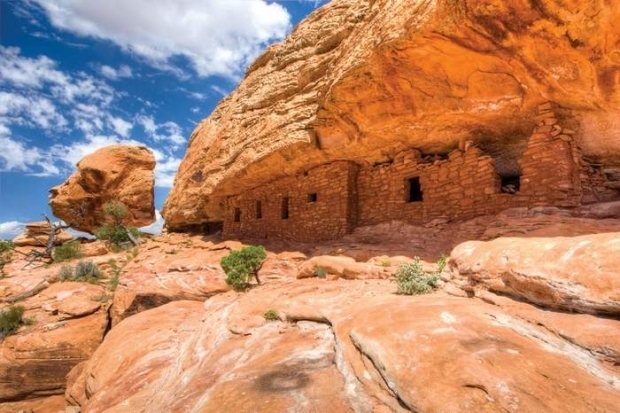 Last week, President Donald Trump announced he was summarily reducing the Bears Ears National Monument by 85 percent, thereby opening archaeologically rich sites to uranium mining. Over the past two months, at administrative chapter houses adjacent to Bears Ears, 98 percent of Navajos voted in support of the national monument designation. These voters are likely voting for more than the protection of sacred sites. Many are likely also there for a say in the future of the uranium mining that has plagued Navajo communities since World War II, when the development of the atom bomb created a demand for yellowcake. From the 1940s to the 1980s, 30 million tons of uranium were extracted from mines on the Navajo Nation. Today, more than 500 abandoned uranium mines remain on the reservation, which stretches 27,000 square miles from the south rim of the Grand Canyon past Gallup, New Mexico, and north to the San Juan River in Utah, poisoning the water and carrying in the dust. Only one mine has been cleaned up. It is estimated that total cleanup will cost between $4 billion to $6 billion and could take a century to complete. A recent study by researchers from the University of New Mexico found 85 percent of Navajo homes had uranium contamination, and Navajos living near these mines have higher levels of uranium in their bones than 95 percent of the American population. Even infants have been found to have uranium in their urine. 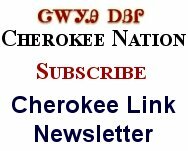 In a penetrating series of articles on uranium mining’s legacy in the Navajo Nation, published by the Arizona Republic in 2014, Lillie Lane, the Navajo Nation’s Environmental Protection Agency outreach coordinator, told the newspaper the radiation has tainted their chromosomes. “I think we are still in the infant stages of seeing what the impacts are in the gene pool of the Navajo people,” she said. Maybe that’s true. 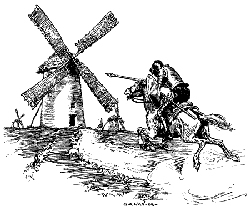 In fact, a gaffe the previous week, in which Trump used a ceremony honoring the Navajo Code Talkers for their service as a chance to take a political swipe at Sen. Elizabeth Warren, D-Mass., by again calling her “Pocahontas,” reminded Indian Country that this wasn’t all about energy. This turn of phrase inevitably brings to mind Ryan Bundy, son of the Nevada rancher Cliven Bundy who led an armed standoff against the Bureau of Land Management, for which he and several of his sons are presently being tried on federal charges in Nevada. Ryan and his brother Ammon famously led a second armed takeover in 2016 of the Malheur National Wildlife Refuge in Oregon and have also been active in Utah. Ryan led armed ATV riders in 2014 over ancient Puebloan villages in San Juan County during a protest organized by County Commissioner Phil Lyman in protest of the closure of an illegally created road through the ruins. In April, Zinke announced the opening of some of these sites (although not the trail Bundy protested) to motorized traffic, citing the right of people with disabilities to have access to them. Lyman (who was convicted of a misdemeanor for his role in the ATV ride) was on stage with Trump last week for the announcement. Trump flattered Utah Republican leaders who flanked him onstage, including Gov. Gary Herbert, Sen. Orrin Hatch and Rep. Rob Bishop. 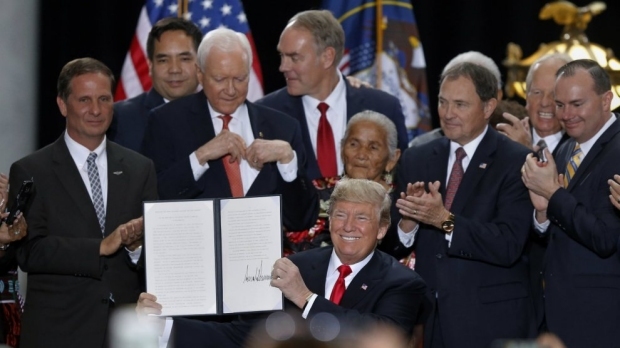 All have been staunch opponents of Bears Ears, a groundbreaking monument proposed by five Indigenous nations: Navajo Nation, Hopi, Zuni, Ute Mountain Ute and Uintah and Ouray Ute. So in that way, the monument isn’t about energy. But in another way it is, especially when it comes to uranium. During Zinke’s review of 27 national monuments, the Utah legislature submitted a 49-page comment claiming Bears Ears National Monument would destroy the state’s uranium industry. 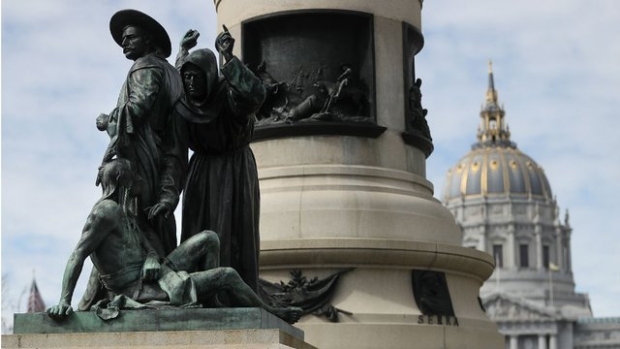 SAN FRANCISCO — The International Indian Treaty Council (IITC) celebrates a victory with the removal today of a racist statute known as the “Early Days Monument” depicting the colonization of California. The statute has been located at 147 Fulton Street in San Francisco, the site of the historic Ohlone village of Yelamu. The owners of an Atchafalaya River Basin property are suing the company building the Bayou Bridge Pipeline (https://topics.nola.com/tag/bayou%20bridge%20pipeline), claiming that Energy Transfer Partners illegally seized and damaged private land on the oil pipeline's route. Filed in 16th District Court in St. Mary Parish on Wednesday (Sept. 12), the lawsuit challenges Energy Transfer's (https://www.energytransfer.com/) assertion that it has the right to take portions of private property to build the 163-mile pipeline. 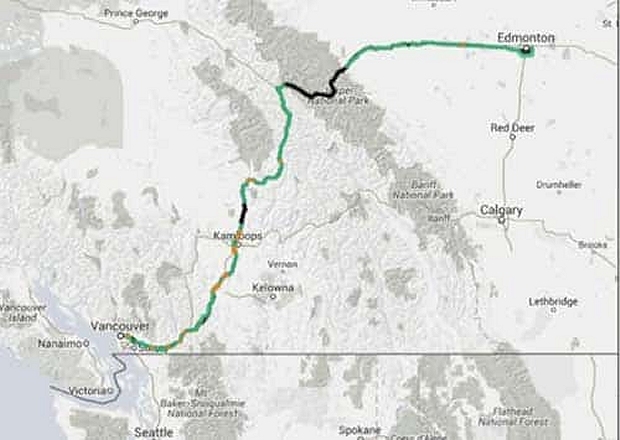 Energy Transfer has justified its use of expropriation, a process similar to eminent domain, by claiming the pipeline is in the public's interest. 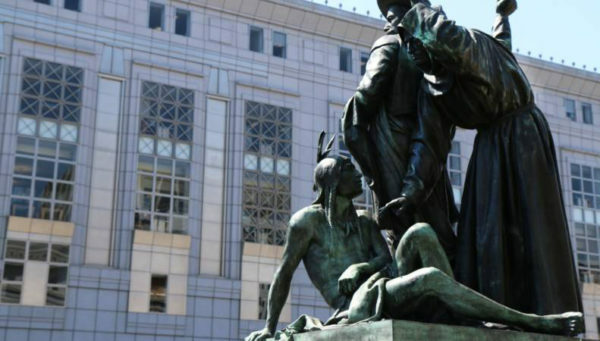 The San Francisco Board of Appeals voted unanimously on Wednesday to remove a controversial statue that activists say is “racist” and demeaning to Native Americans. The “Early Days” statue, which was erected in 1894, depicts a fallen Native American man at the feet of a Spanish cowboy and a missionary. The statue is one of five that comprise the Pioneer Monument in San Francisco, which commemorates the settling of the state. “This has been a tough 30-plus years. 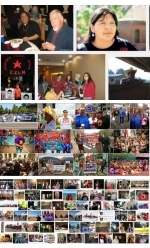 But this is wonderful,” Dee Dee Ybarra, an Ohlone tribal leader, told the San Francisco Chronicle. Native American activists have pushed for decades to have the statue removed, an effort that saw renewed energy amid the nationwide debate over Confederate monuments. Critics have long said the sculpture inappropriately celebrates the oppression of Native American people. 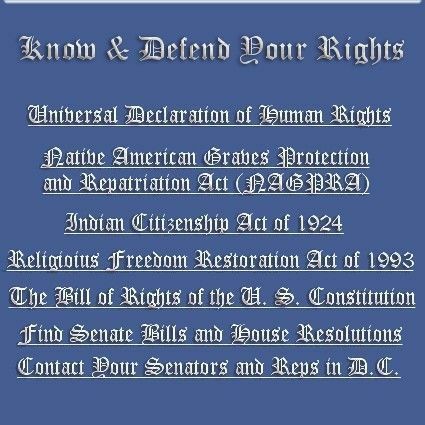 Key to the effort is legislation in Congress which would prevent the reservation from being taken out of trust. With the executive branch willing to walk away from any responsibilities, passage of the Mashpee Wampanoag Tribe Reservation Reaffirmation Act appears to be the only hope for success. “The decision by the Trump administration to move forward with denying the Mashpee Wampanoag a right to their ancestral homeland and to keep their reservation is an injustice," Sen. Ed Markey (D-Massachusetts) and Sen. Elizabeth Warren (D-Massachusetts), the sponsors of S.2628, said in a joint statement on Friday. Groups want investment in renewables, not dirty coal on Navajo Nation. 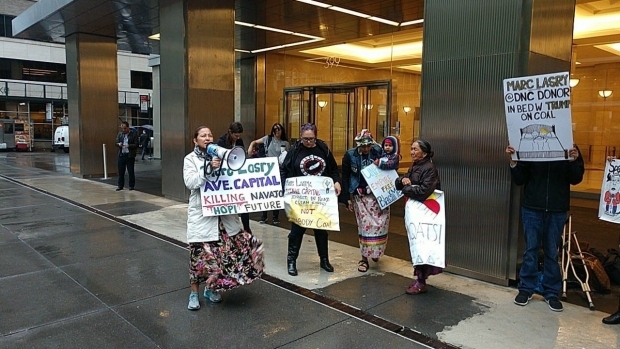 In a steady rain, more than a dozen Navajo Nation and Hopi Tribe members protested Monday outside the New York City offices of Avenue Capital Group, a private equity firm that wants to purchase the coal-burning Navajo Generating Station (NGS) in Arizona. They had traveled from their homes in northern Arizona to oppose the private equity firm’s proposed acquisition of NGS, the largest coal-fired power plant in the western United States, and to advocate for clean forms of energy in the Four Corners region. The facility — which spews tons of the most hazardous air pollutants — was on its way to shutting down in 2019. But Avenue Capital Group’s interest in purchasing a majority stake in the plant has brought new life to the highly polluting facility. 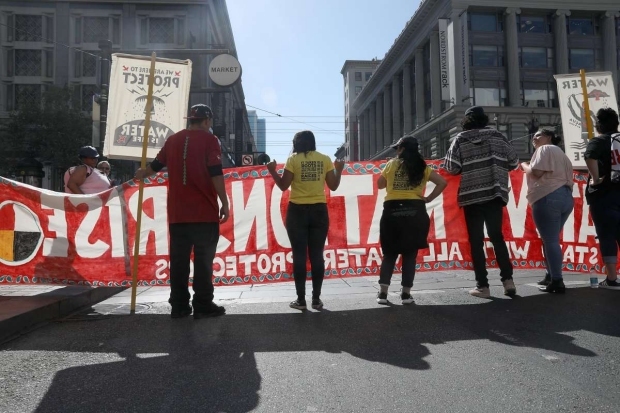 PAGE, Ariz. – Members of the Navajo Nation are in New York City Monday to call attention to the fate of the biggest coal power plant in the West. The Navajo Generating Station in Northern Arizona is set to close next year. 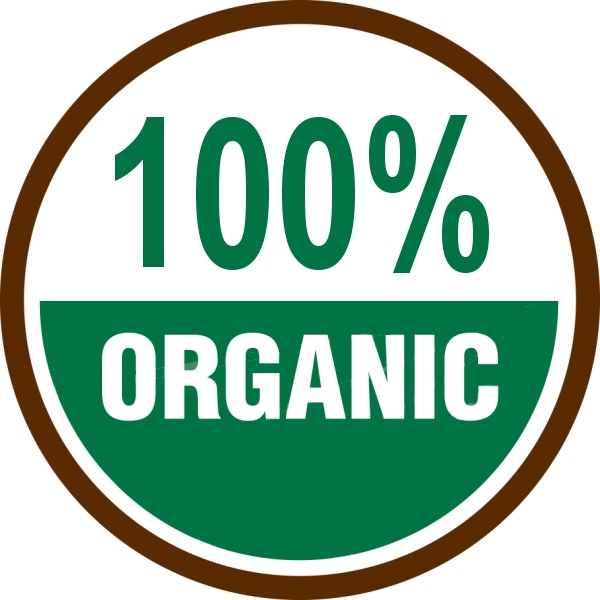 But New York investment firm Avenue Capital Group is considering buying it. 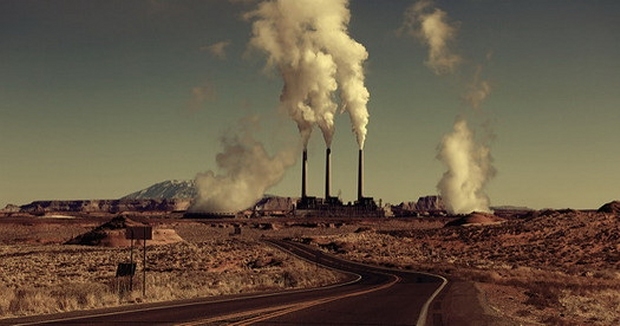 The coal plant provides hundreds of jobs to Navajo people and is a major source of revenue for the tribe. 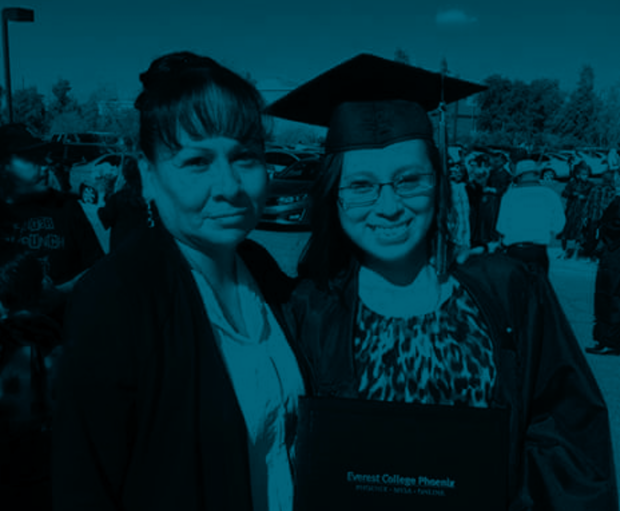 This is critical on the Navajo reservation where unemployment is around 45 percent. So, many Navajo support the sale and continued operation of the plant. But Nicole Horseherder, executive director of the Navajo environmental group To Nizhoni Ani, says the coal plant has led to air and water pollution, and health consequences for her neighbors. 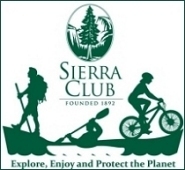 NEW ORLEANS (AP) — The company building an oil pipeline through environmentally sensitive south Louisiana agreed Monday to temporarily halt the project on one piece of private land while a legal dispute plays out. Environmentalists hailed agreement, saying it will delay completion of the Bayou Bridge Pipeline at least until after a November hearing on company efforts to obtain the property through a process called expropriation. However, Energy Transfer Partners in Dallas, the majority owner of the project, said in an email that the agreement will not affect the timing of the project's completion. It has said in court records it expects to complete construction by October. 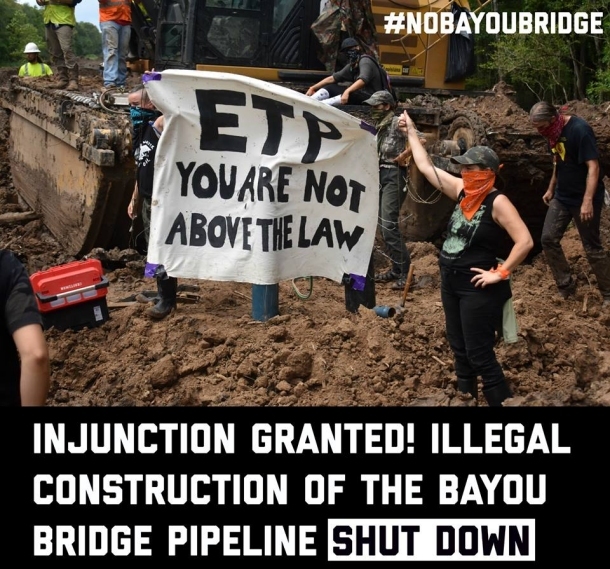 A Louisiana Court has granted an injunction against Energy Transfer Partners (ETP) shutting down illegal construction of the Bayou Bridge Pipeline in part of the Atachafalaya Basin. 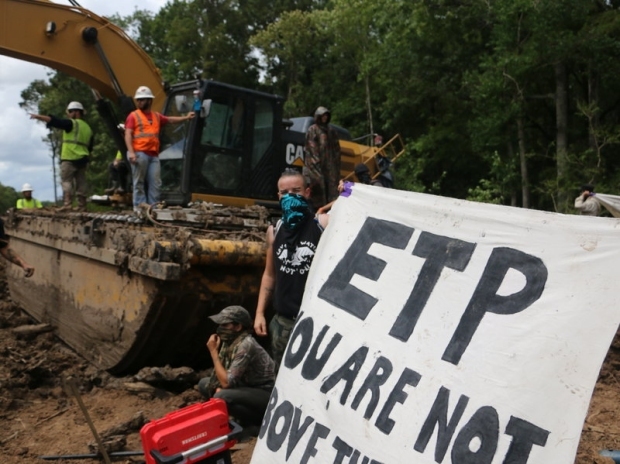 We have been tased, pepper sprayed, put into choke holds and beaten with batons to stop this illegal construction that ETP was carrying out despite not having an easement for the land. Now a court has validated our claims and has banned all ETP employees and workers from the site and banned any form of construction activities. While this is a major victory, construction of the Bayou Bridge Pipeline continues in other parts of the Atchafalaya Basin. We won't stop until completely shut down the Bayou Bridge Pipeline. JOIN US on the frontlines by emailing resist@nobbp.org with your name, phone number, why you want to come to camp, when you will be arriving and how long you plan on staying. We will respond with the directions to camp and what to bring. Traumatized Children at the Border - Video by The Atlanticono lawyer, Jodi Goodwin, who aggressively advocates for their release from their respective ICE detention centers, Anita and Jenri are reunited after a month apart. But the damage has been done. The Separated, a new documentary from The Atlantic, is an intimate window into the chaos and trauma caused by the separation. "You don't love me anymore,” Jenri says to Anita after they arrive at a temporary shelter. “You're not my mom anymore." 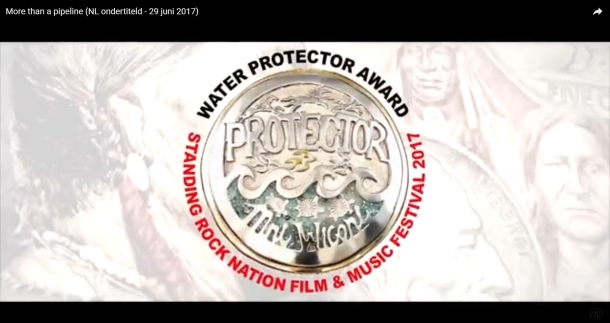 Water protectors from the L'eau Est La Vie Camp argue that Energy Transfer Partners (ETP) does not have an easement agreement with Theda Wright, one of the property owners; therefore, the construction on Wright’s land to build the pipeline is illegal. "I’ve been asked to protect this piece of land and I intend to do it," said one water protector at a construction shutdown on Labor Day. Four water protectors from the L’eau Est La Vie Camp in southern Louisiana were arrested on Tuesday while taking action against Energy Transfer Partners’ Bayou Bridge Pipeline. What began as a check on the status of construction turned into a multi-hour shutdown of work by the members of the camp. 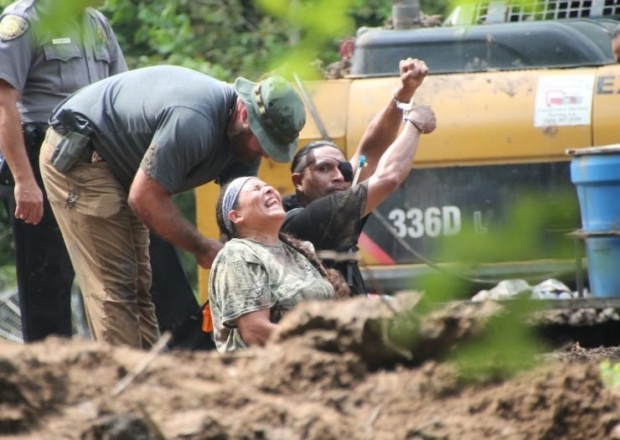 Pipeline workers called the St. Martin Parish Sheriff’s Office, and	tensions rose when their reinforcements arrived on site, eventually leading to apparent violations of human rights and the safety of those attacked by law enforcement. Deputies also used pepper spray, had their batons out, and strangled Foytlin and “Patch,” another indigenous water protector. 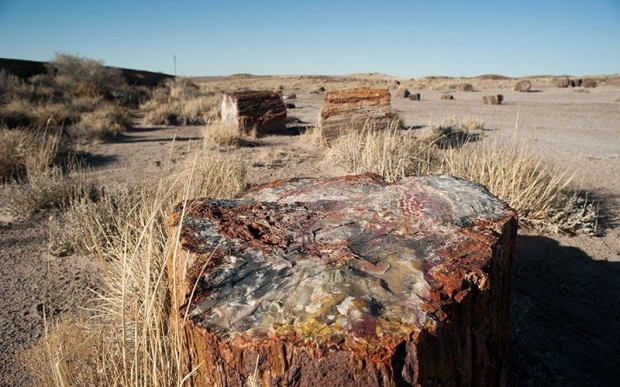 PHOENIX— The Bureau of Land Management today plans to auction off 4,200 acres of public land for oil and gas leases in northern Arizona near Petrified Forest National Park and two rivers. Parcels that do not receive bids today will be available for noncompetitive leasing for two years. 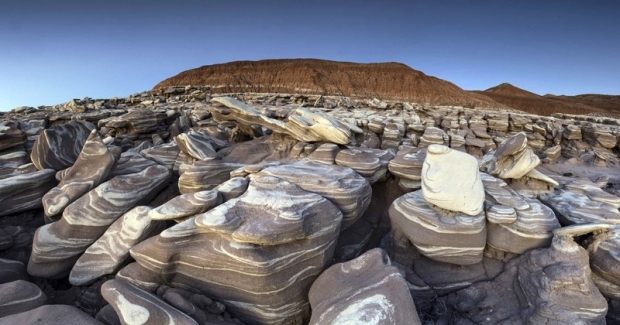 The sale will put the land at risk of chemical spills and water contamination that could harm the Little Colorado River and Silver Creek, threatening endangered species and water users. MASHPEE, Mass. — In a major blow to the Mashpee Wampanoag Tribe, the Trump administration’s Department of the Interior – Indian Affairs on Friday issued a determination to the tribe saying it could not keep 321 acres of land taken into trust during the Obama administration. 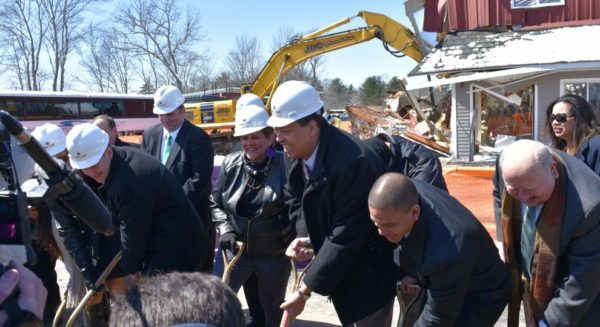 The determination now puts the Mashpee Wampanoag Tribe’s planned $1 billion casino on hold indefinitely. Mashpee Wampanoag tribal leaders vow to continue their fight to retain its reservation and push for passage of bipartisan legislation to protect its land after Friday’s determination. 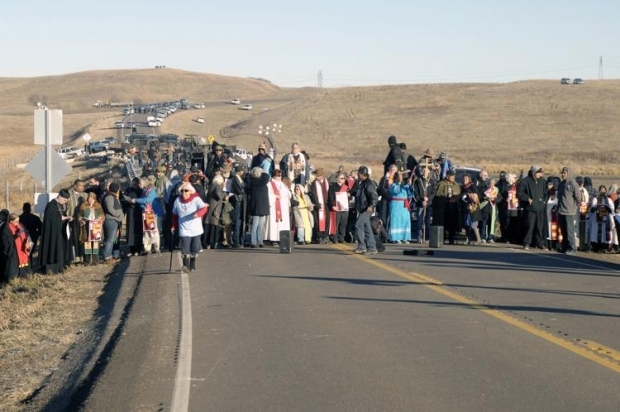 “We have been on this land for 12,000 years and we are not going anywhere. This only underscores the urgency of passing the Mashpee Wampanoag Tribe Reservation Reaffirmation Act immediately. We implore Congress to act now,” said Mashpee Wampanoag Tribal Council Chairman Cedric Cromwell. 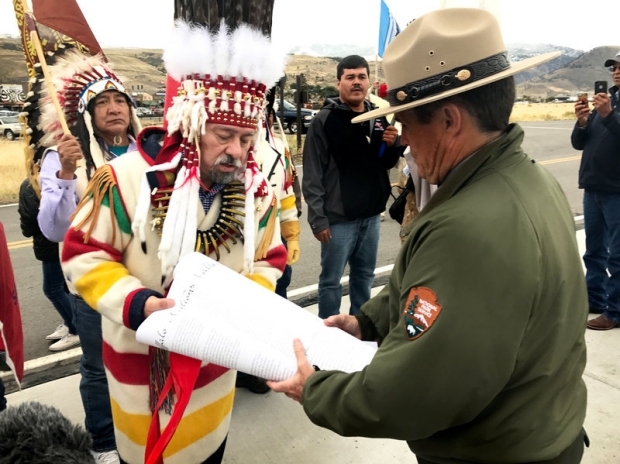 Friday’s decision was issued after a court-ordered review to determine if the Interior Department has the authority to hold the historic tribe’s Land-in-Trust under a different legal category within the Indian Reorganization Act than the one previously issued. In September 2015, after a decades-long examination of archeological, anthropological, and historical evidence, the Interior Department officially moved to hold 321 acres of land in Mashpee and Taunton in trust on behalf of the tribe under the IRA on the grounds that the Mashpee Tribe had maintained ties to an existing reservation since time immemorial. A lawsuit funded by an out-of-state casino developer was then filed challenging the Interior Department’s legal reasoning. 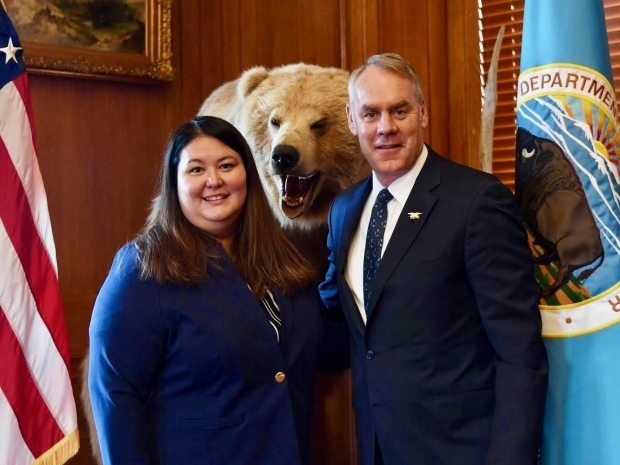 A subsequent federal district court opinion remanded the initial 2015 reservation declaration back to the Interior Department for further review. 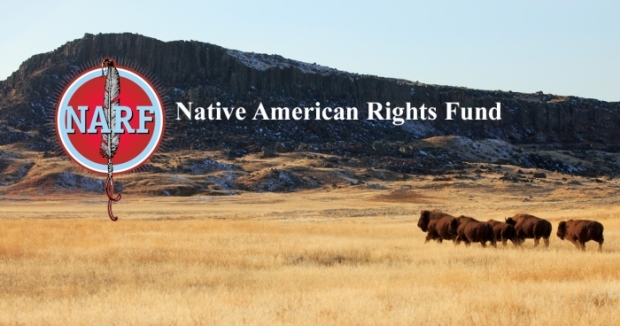 “Let’s call it what it is: a grave injustice initiated by an out-of-state casino developer to undermine the rights and sovereignty of native people. This is a tremendous blow to our Tribe without whom America’s earliest settlers would not have survived and it should also alarm Tribal Nations all across Indian Country,” Cromwell said..
On Friday, at a speech in Fargo, North Dakota, the president made a strange appeal to Native American voters. “Maybe they don’t know about what’s going on with respect to the world of Washington and politics, but I have to tell you, with African-American folks, I would say what do you have to lose?” he asked. 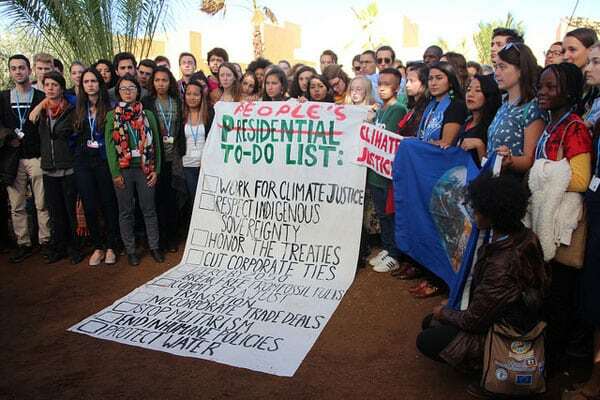 It's these communities that are hardest hit by the climate crisis––even though they are the least responsible for causing it. 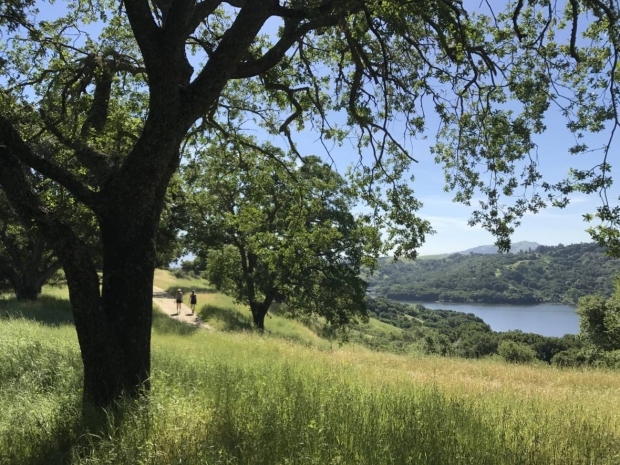 In addition, these communities, by design, are most imperiled by environmentally devastating extractive industries like coal mining, tar sands, fracked gas and more. Let's be clear: Climate change isn't just a scientific issue—it's an issue of racial inequity, economic inequity and cultural genocide. 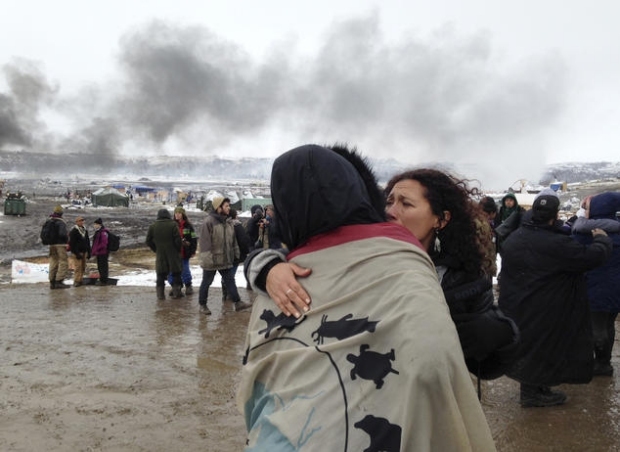 A new study on the Dakota Access Pipeline likely won’t change the opinions of supporters and opponents of the project. The person who counts, U.S. District Judge James Boasberg, received the study on Friday, but hasn’t ruled on it. 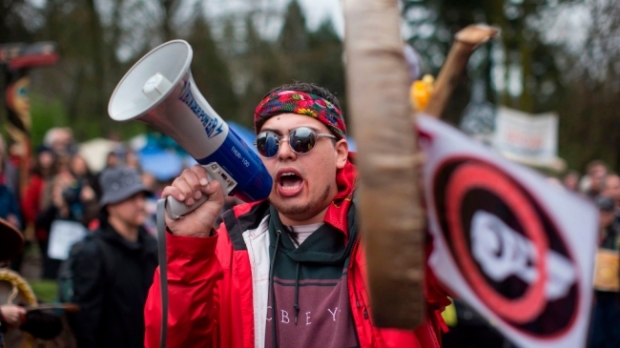 Seattle — A landmark court decision issued Thursday casts doubt on whether Kinder Morgan’s troubled and controversial Trans Mountain pipeline project can go forward. 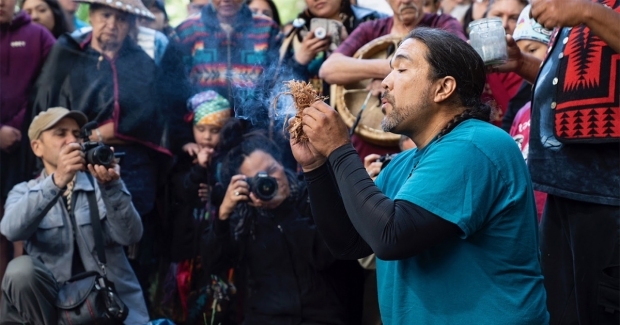 United States Coast Salish Tribes — including the Swinomish Indian Tribal Community, Tulalip Tribes, Lummi Nation, and Suquamish Tribe — are celebrating the decision, which finds that the permits for the pipeline were issued illegally. Error Message: "This operation has been canceled due to restrictions in effect on this computer. Please contact your system administrator." 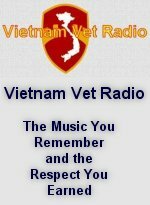 "This operation has been canceled due to restrictions in effect on this computer. Please contact your system administrator."